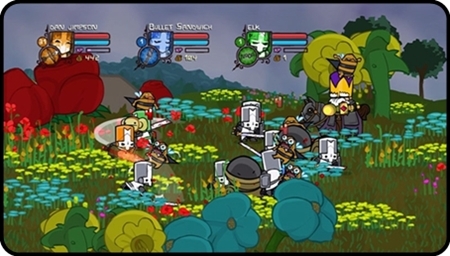 Talk about delayed, Castle Crashers originally appeared on XBLA in 2008, it then hit the US PSN Store in August, which is where the demo ensnared me. I’ve had to wait until now for a European release PSN release. But was it worth the wait? Hell yes. Hell, yes. This retrotacular title is a side-scrolling beat-‘em-up with a few simple RPG elements thrown in for good measure. It’s great fun on your own, but to get the most out of this game you should really fire up the multiplayer. You can have up to four players with drop-in co-op action. You can even play it online, but this can throw up problems when you both want to be the same character (because it’s the only one you’ve spent ten hours levelling up) so one of you will be on Level 30+ while the other is Level 1. At least you can revive team-mates. So the best way to do it is to play with the same people regularly either at home or online. Or level up every character in the game if you have an insane amount of time on your hands. Not to mention a few spare thumbs in the cupboard. Yes, this is a bit of a button basher. The square and triangle buttons are used for regular and strong attacks respectively. Early on in the game new moves are unlocked about every other experience level or so. These run out pretty quick though which is a little disappointing. You might find yourself getting better at combat with the limited move-set you have. For example it’s possible to juggle groups of small enemies with a jumping attack. You can rack up some serious numbers flying across the screen unleashing some major sword skills. The action is side-scrolling, but you can move up and down the screen (like Golden Axe or Streets of Rage). This led to a few instances of being slightly too high or low and weapon swings completely missing an enemy. For some reason this happened more with bosses. I know. How? They’re huge! The same problems affect the beach volley-ball mini-game too, which apart from that is a nice distraction. Levelling up is a simple affair with experience points awarded for dishing out damage. Every time you go up one you can allocate points to strength, magic, defence or speed/archery. Level 30 was enough to complete the game, but you can go far beyond that. If you want to use a different character you’ll have to start at Level 1 again. So you might want to test all the available characters to see which of their unique magic spells you prefer, don’t get the lightning guy, he’s rubbish. There’s fire, ice and poison to choose from too, with more characters unlocked along the way. Animal orbs can be collected to act as perks. These adorable floating animals that follow you around are likely to cause arguments when playing in multiplayer, especially when you accidentally pick up a different one and your partner swipes the one you had. Apart from being adorable they’ll help you out in different ways. The ram will knock over enemies, the bat bites them, the seahorse lets you move through water at normal speed and the giraffe (“mine!”) helps you level up faster. There are loads to find or buy, which will keep you playing long after the final credits roll. The art style will be instantly recognisable to any fans of The Behemoths well-loved cult classic,Alien Hominid. The thick black lines around the comic book-style cells are amongst the sharpest looking graphics on PS3, your HD TV is going to love it. The design of the all the heroes and enemy soldiers is great, but it’s the bosses that really steal the show with their mix of craziness and humour. There really isn’t anything else like this on PSN. Don’t even think of comparing this to the Scott Pilgrim game which used retro as an excuse for looking like pixelated vomit. As awesome as Alien Hominid was, it was a bit on the really hard side. Castle Crashers is a lot more user-friendly, but there’s an insane mode for those of you demanding an old-school challenge. The only times I found the game to be really difficult was for some of the later levels that would throw a few large brute enemies at you in a row. A bit of levelling up by replaying a few levels though and I was able to progress. You don’t have to do a lot of backtracking grinding to be honest. There are loads of levels to work through, the map just keeps going and going through the old-school environments of lava fields, forests, snowy tundras, deserts, caves and castles. A small part of you wants to get to the end, but the rest of you is glad there’s more to play as you’ll be having a great time. There are some levels were you can ride animals such as dragons or camels. To be honest though they’re barely used, so much so that by the time you ride the camels you may have forgotten about the dragon 20 levels earlier. Golden Axe’s (not the awful 2008 game) dragons still hold the number one spot though. The Short Version: It would have been nice to see a few extra moves for the combat, but otherwise the game is a joy to play. I’m usually the first to moan about the prices on PSN, but I have to say Castle Crashers is worth every penny and the long wait on it’s epic quest from the clutches of XBLA. It’s a great adventure packed with charm that will last for hours and the multiplayer games will extend it’s life even further.